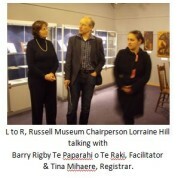 On Sunday 9 August, Te Paparahi o Te Raki (The Northland Inquiry) facilitator Barry Rigby and Registrar Tina Mihaere met with the Russell Museum trustees and staff in order to give special acknowledgement of Russell Museum’s recent exhibition “An Unsettled History”. Barry Rigby expressed an appreciation for the timing of “An Unsettled History” as a means of informing the public about the Waitangi Tribunal’s role and the historic Treaty Claims currently taking place in Northland. Stopping off in Russell on their way to the opening of the third week of judicial hearings at Panguru in the Hokianga, Barry Rigby and Tina Mihaere viewed “An Unsettled History” and took time to discuss with museum trustees and staff how the exhibition followed in the footsteps of other “resistance” exhibitions such as Parihaka: The Art of Passive Resistance (2001), which explored the impact and repercussions of the storming of Parihaka Pa and “New Zealand Māori Culture and the Contemporary Scene” (1966) in which contemporary Maori art was contextualised by historical objects. Te Paparahi o Te Raki is an inquiry in to He Whakaputanga o Rangatira o Nu Tireni (The Declaration of Independence, 1835) and Te Tiriti o Waitangi (The Treaty of Waitangi, 1840). The third week of hearings started at Panguru on Monday 9 August and finish Friday 13 August. They are open to the public. The fourth week of hearings in which Crown evidence will be presented may be held in Whangarei in September 2010. Russell Museum chairperson Lorraine Hill presented Barry Rigby and Tina Mihaere with a special booklet of “An Unsettled History” in honour of the occasion. Barry Rigby hoped claimants would come and view the exhibition before it closes in two weeks on Monday 23rd August.